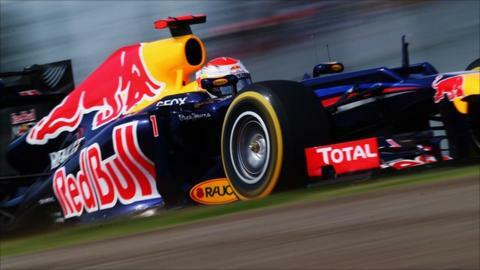 Red Bull's Sebastian Vettel was in a league of his own as he took pole position for the Japanese Grand Prix. The German headed team-mate Mark Webber and McLaren's Jenson Button, who will be demoted to eighth because of a penalty for changing his gearbox. That will put Sauber's Kamui Kobayashi third, ahead of Lotus's Romain Grosjean and Sauber's Sergio Perez. Championship leader Fernando Alonso will start sixth ahead of Lotus's Kimi Raikkonen. Lewis Hamilton is ninth. Following qualifying Vettel was asked to go to the stewards after it was alleged he blocked Alonso at the chicane. He was given a reprimand but allowed to keep his pole position. Alonso is 29 points ahead of Vettel in the championship, with Raikkonen third and Hamilton fourth. Force India's Nico Hulkenberg rounded out the top 10, but will take a five-place grid penalty for changing a gearbox, while his team-mate Paul di Resta missed out on a place in the top 10 shoot-out by just 0.055secs - the margin separating him from Hulkenberg. Questions were raised about Kobayashi's position as the Japanese set his fastest time after passing the stranded Lotus of Raikkonen, who had spun at Spoon Curve. All 10 drivers were out on their final runs at that time, but only Kobayashi and Button improved their lap times. However, BBC Sport understands that although Kobayashi improved his time in the middle sector of the lap, in which Spoon is contained, he did not go faster than previously in the specific part of the track in which the caution flags were being shown. So he may well not be penalised. Perez had set his fastest time just before Raikkonen's spin having gone out a little earlier. Alonso said Raikkonen's spin had cost him third place on the grid. "We were the only ones to get it," said Alonso. "Five seconds there were no yellow flags, the car behind me was a green flag already, so we just lost probably position four, which was our target on the split times. "With Button's penalty it would have been starting third tomorrow, so the race was much different. Very unlucky." Hamilton said that without the Raikkonen incident he would have been "fourth or fifth - I was three or four tenths up at that time and had more time to find. "It still wouldn't have been spectacular for us, but it would have been better than ninth." He said he had made a "huge mistake with the set-up I went with but that's motor racing. "We were kind of on [Red Bull's] pace in practice. We made some changes and it was the complete wrong way. Our car is clearly good. Jenson did a good job with it, and it's a shame I wasn't able to extract more form it but hopefully tomorrow I will." Vettel looks in imperious form - he had been blisteringly quick in final practice and continued that pace into qualifying. "We had almost the perfect qualifying," he said. "The car felt fantastic and I couldn't have asked for any more." Webber was actually faster than Vettel in the first sector of his best lap but a mistake at the hairpin, where the Australian ran a little wide after a slide on entry, cost him time. He ended up 0.251secs behind his team-mate but will be expecting to challenge Vettel in the race. Webber: "This place on low fuel with fresh tyres is something else. I was pretty happy with my first lap apart from the hairpin. Then Seb had that couple of tenths and I thought fair play it was a big lap from him. "We were pretty competitive in qualifying and that puts us in good stead for tomorrow." Button said: "We're just not quick enough. It would be very difficult for me to put my finger on where that 0.4secs [deficit to Vettel is]. "It's going to be a very difficult race for us." Other grid penalties include a three-place drop for Toro Rosso's Jean-Eric Vergne following a block on Williams's Bruno Senna in Q1, leaving him in 19th. And Michael Schumacher's 10-place penalty after his crash with Vergne in Singapore, which sees the German start 23rd. Qualifying highlights on BBC One 13:00 BST. Race: 06:55 BST, 5 live and live text commentary online. Highlights on BBC One 14:05 BST and Mon 8 Oct at 00:35 BST on BBC Two.